A New Year and a new article, welcome to 2009… as far as this site goes anyway. I hope everyone had a good holiday season and feels suitably gorged on turkey and After Eights. 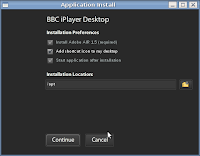 A significant piece of news which might have been drowned out by all that festive white noise was the release of the BBC iPlayer application for Linux and Mac platforms. The iPlayer for anyone who doesn’t know is an application which allows you to play content from the BBC’s various TV & radio stations for up to 7 days after broadcast on demand. This means if, heaven forbid, I should miss Q.I then I can still catch up with it at my convenience. There are some caveats I should mention on behalf of all readers living outside the UK. Sadly the service has been restricted to UK IP addresses only for licensing reasons, “due to the unique way the BBC is funded…” as they always seem to reel off it’s only available to UK residents. So I apologise to any readers for whom this article is not relevant but I felt it was a development worth covering. This new desktop version is an Adobe AIR application which is closed source and proprietary but like the ever present Flash I felt it was worth trying out and investigating as most Linux users are likely to cross paths with it. Back when the iPlayer was first launched in December of 2007 there was only a Windows XP desktop application, it didn’t even work with Vista or Internet Explorer 7 which obviously upset some Mac and Linux users. However, Rome wasn’t built in a day and the BBC duely managed to fix things by offering content to all platforms through a Flash-based web interface similar to YouTube, which most users already knew and understood. The main difference between the web and desktop versions was you could only stream and watch videos on the web but the actual application was able to download the files and save them to your computer. Unfortunately the saved files are encumbered with DRM (boo hiss! ), again for legal reasons and the files self-destruct after 7 days, it all sounds very Mission Impossible but there we go. Now that Adobe have released their AIR platform for Linux and Mac we can all get in on the action and try it out at least, I decided to see how easy it was to install and use the iPlayer Desktop on Linux. In order to download and install the iPlayer Desktop you first have to agree to become what they’re calling a “labs tester”, don’t worry there’s no injections or drug trials that I know of. In reality this doesn’t involve much more than going to http://bbc.co.uk/iplayer/labs and clicking the pink button which says “I want to be a Labs tester”. After that you’re just taken back to the main iPlayer home page, there’s no prompting to enter an email address or any other details which makes the whole sign up process seem a little redundant to me. Perhaps it’s a legal thing so they can say you knew this was testing software if anything goes wrong, I’m not sure. Anyway, after this you will notice there’s now a download button below the video window when you visit a program page on the iPlayer website. This doesn’t appear unless you’re a Lab’s tester and clicking on it begins the install process for the desktop app. The installation process itself is refreshingly simple and worked very well for me on Linux Mint 6. 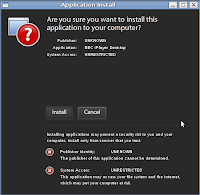 First up Adobe AIR is installed for you and then a pop out window takes you through the rest of the steps. You’re prompted to accept license terms and sign your life away as with all proprietary software but it doesn’t take long. I’ve recorded every single step of the installation process which you can follow in the slide show linked below if you like. One thing I did find strange is you’re prompted to accept the terms and conditions and the publisher field says UNKNOWN in loud capital letters, where the system access field says UNRESTRICTED, complete with alarming red crosses. I’m not sure the reason for this but it’s a bit off putting. The unrestricted access thing I suppose is to be expected but why it doesn’t say BBC as the publisher I have no clue. Within a few minutes I was greeted with the working iPlayer Desktop and it was already downloading the program I’d selected Charlie Brooker’s Screenwipe, which I heartily recommend to you though perhaps it’s not for the easily offended. The program downloaded pretty quickly and I was able to watch it fine within the iPlayer itself but not in any external programs. On my system it created a folder inside my main /home/dan/Videos directory called “BBC iPlayer”, you can see from the screen shot that this contains another folder called “repository” and if you fish around in there you can find the raw video files. They appear to be standard Mpeg4 files but you can’t play them in Totem, VLC or anything else. This must be the DRM earning it’s money I guess. Interestingly the little intro clips for each channel contained in the “cache” folder are clearly not protected as they play fine in Totem. I played the Charlie Brooker video in the iPlayer and it works well enough, you can switch to full screen and the controls are pretty simple but the video quality isn’t stunning. Of course there are bandwidth concerns and file size issues for the BBC to wrestle with I suppose but I had hoped the picture would be better than the Flash version on the website, to my eyes it wasn’t but that’s just an observation. Having used the program for a couple of weeks now and downloaded a fair few items, I have to say it’s pretty well written. I’d heard all kinds of horror stories about how unstable Adobe AIR was on Linux but so far they’ve proven unfounded. The iPlayer has never crashed, frozen or gotten up to any other shenanigans on me yet, touch wood. There are a couple of things however that I don’t like. For instance the program will launch itself every time you log into your machine and pop up in the middle of your desktop in a “look mum no hands” kind of fashion. Clicking the X in the top corner to close it simply minimises the program to the system tray and it’s still running, you have to right-click on the tray icon and choose “exit” to actually banish it. I suspect the reason for this is quite cunning as the iPlayer relies on P2P file sharing technology to distribute it’s large video files. This is the same supposedly evil technology the likes of the MPAA would have you believe should be eradicated before it destroys all that is good and holy. That’s a rant for another day but I believe the reason the iPlayer always wants to be running is to seed and upload any videos you have on your system to other active users. If it’s Peer-To-Peer then it must do right? The iPlayer uses Kontiki as the file sharing back end and this has proved controversial in some quarters, not least with Internet Service Providers who complain it will use too much of their bandwidth. None of this really bothers me and I have no proof the iPlayer opens by default for this reason but I think it’s pretty likely. I also think users should be told this more clearly up front. I don’t have any problem at all with the principle, I understand how P2P works but it could adversely affect users on slow connections who don’t have the same understanding. If I’m honest I wasn’t expecting the iPlayer application to work very well on Linux but I was totally wrong, it really does it’s job well from a technical perspective. It’s good to see Linux is now supported as fully as any other platform but I think we have Adobe to thank for that more than anyone else, had they not released AIR for Linux then I suspect the only penguins we’d see anywhere near the iPlayer would be accompanied by a David Attenborough voice-over. I’m impressed with the technology even if I’m not overly keen on the DRM aspects, the lack of any kind of subscription option at the least for overseas users and of course the closed-source nature of it all. I think the software has been very well developed and the BBC technical team deserve credit for this, hopefully it will continue to evolve and improve. I’d like to see the option to subscribe to shows and be notified of new episodes almost like a video podcast. Technically it shouldn’t be that hard to do with RSS feeds and it would be a great addition. So if you’re on Linux and you live in the UK I suggest you try out the iPlayer and see what you think, you can let me know your thoughts in the comments. It’s certainly worth a look whatever your feelings on DRM and the other issues, having the option to use this software on Linux and being considered equally has to be a good sign in the long run. To bad my ISP filters torrent traffic, as it would be nice to try it out (Yeah BBC, doesnt work at all with my ISP) (UK = Orwellism) Anyways, I never heard about AIR being unstable on Linux, only it being insecure. So none of the BBC content works for you? That’s a shame. What ISP are you with btw? Presumably the online Flash version of the iPlayer would still work, though it’s not quite the same thing. @RedBrain – Thanks mate. You like the iPlayer then? Did you try out the AIR application on Linux too, how did it run for you? 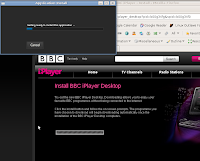 Dan, I’ve never managed to install and run BBC iPlayer on my Debian. Well, I’ve got it installed, but I can’t run it; it complains that it has its encrypted storage broken. Installing a Windows version of AIR in Wine didn’t help either, as did not help older one for Linux. @Andrew – I never tried this on Debian but to be honest I have no idea if it still works on any distro now. Things might have changed as this article is nearly 3 years old. Adobe just announced they are killing Flash but AIR is staying as far as I know. Sorry I can’t be of more help. Might be worth checking the BBC site to see if they changed anything. Sounds like the encryption key is out of date possibly.